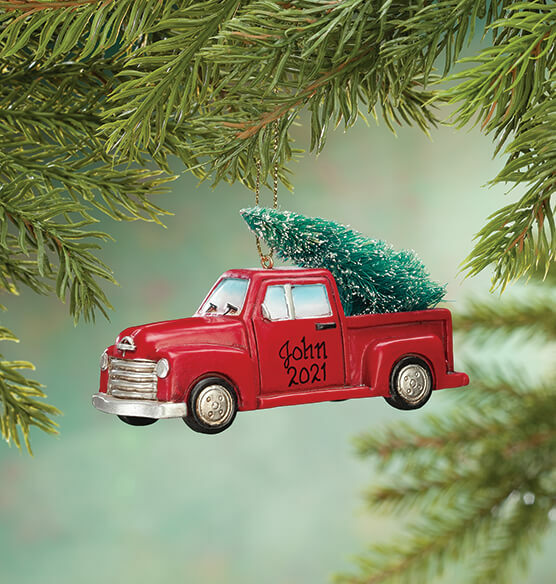 Loaded with beloved Christmas cargo, this personalized Red Truck with Tree ornament arrives to celebrate merry memories and inspire new ones, year after year! Our exclusive 3-D Christmas ornament is wonderfully detailed all around, complete with snow-capped "spruce" for added fun. We'll personalize! Limit 2 lines, 8 letters/spaces each. Resin. Personalized ornament measures 3 3/4" long x 1 1/2" wide X 2" high. This little red truck reminded me of my father's 1940 red chevy pickup. ?? I am pleased with this personalized Christrmas ornament. I just love all of the items ordered from the Miles Kimball catalog. I picked quality at excellent prices. My orders were for gifts and myself. My final price for all orders was around $400, but it would have been around $800 without free shipping and a huge percentage off each order. I have all my Christmas shopping done and am very happy. Next year, I will do all my online shopping with your company. Thank you! Each year we drive into the forest to cut down our Christmas Tree; eat lunch and drive home with our perfect tree strapped to our red truck. It is always a bit taller in the house than it was in the forest. The initial packaging was so flimsy that the box was open and it "appeared" the ornament had fallen out/I did not receive it so had to ask for a replacement. The painting on the replacement was sloppy and again I was disappointed. My new grandson was born into a Chevrolet family - this is perfect. My daughter loves this Christmas truck with tree. This is her first year with her own tree so we wanted a way to commemorate the year with this special ornament.